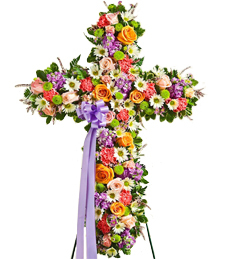 Precious pastels in naturally beautiful shades of invigorating green, shimmering white, precious pink, and lavish lavender come together in unison for a picture perfect token of unconditional love and compassion in a time of sacred healing. 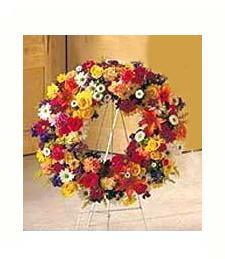 Give that special loved one a Dazzling Cross of Colors Sympathy Wreath and wash away all their troubles. 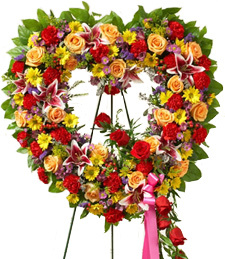 Stand by their side with a brilliant hued Open My Heart Sympathy Wreath in the perfect glorious shades of ravishing red, mystical purple, precious pink, sunburst yellow, and shimmering peach. Be that spiritual guide at their side in this difficult time and your unconditonal friendship will be cherished for a lifetime. 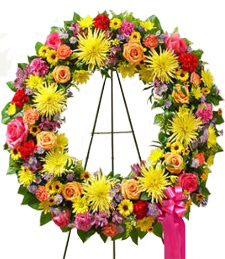 Its time for those unforgettable Springtime Melodes with a perfect ravishing hued sympathy wreath for that grieving loved one to forget all their troubles. 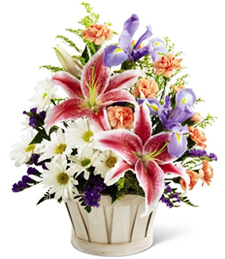 Embrace them with natural beauty in brilliant shades of scarlet red, sunburst yellow, juicy peach, and mystical purple to set the occasion right. 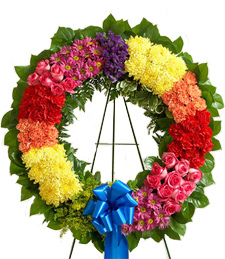 Its time for A Rainbow of Love with a perfect ravishing hued sympathy wreath for that grieving loved one to forget all their troubles. 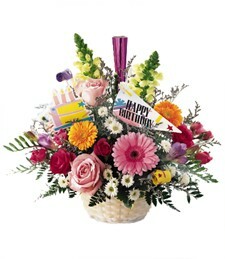 Embrace them with natural beauty in brilliant shades of scarlet red, sunburst yellow, juicy peach, and mystical purple to set the occasion right. 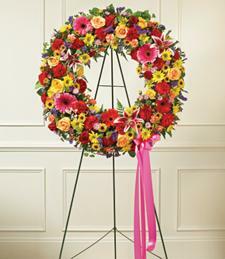 Embrace a multi-colored hued Rainbows of Heaven Sympathy Wreath with a perfect ravishing shades of scarlet red, sunburst yellow, juicy peach, and mystical purple to set the occasion right. 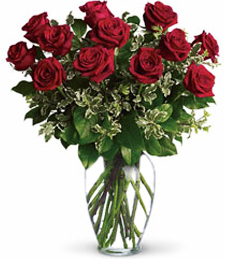 Make that special someone forget their troubles with an eye-riveting natural beauty that brims with bold pleasures. 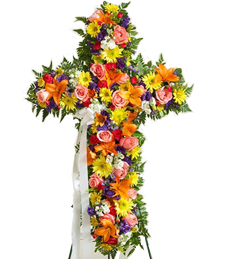 Hold your faith with a Cross of the Heavens Sympathy Wreath artistically designed with the most precious brilliantly hued blossoms in shimmering shades if red, yellow, white, pink, and purple to sooth that grieving loved one's soul. 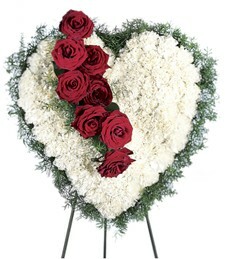 Send a floral tribute to that grieving love done and your deep compassion will be cherished for eternity. 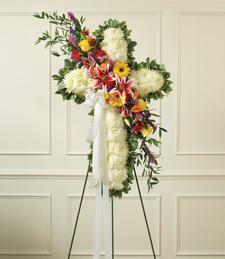 Hold your faith with a Cross of Rainbows Sympathy Wreath artistically designed with the most precious brilliantly hued blossoms in shimmering shades if red, yellow, white, orange, pink, and purple to sooth that grieving loved one's soul. 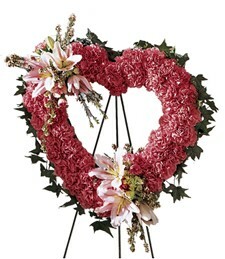 Send a floral tribute to that grieving love done and your deep compassion will be cherished for eternity. 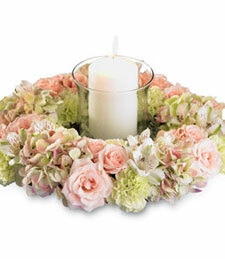 Enjoy the beauty of pristine white flowers and the soft glow of candlelight with this exquisite centerpiece. 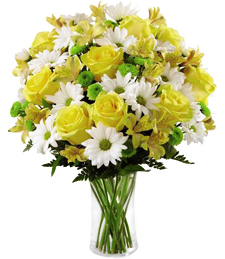 Breathtaking appeal and sweet floral scents make this a simply stunning arrangement!